condition is not curable, it can be managed and taken care of, using medicines as well as different all-natural or home remedies. 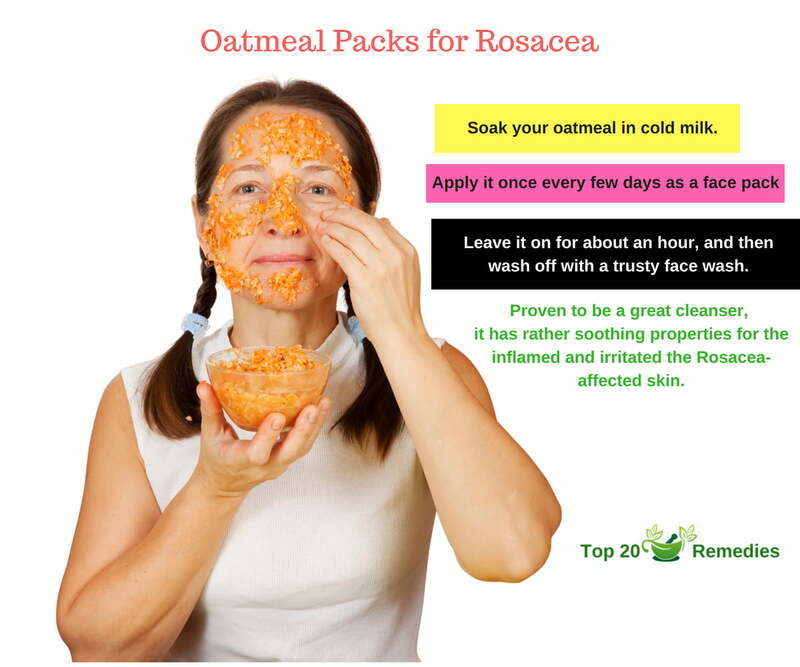 Here are the best home remedies for treating rosacea. If untreated, pimples often develop and in most severe cases the nose grows swollen and bumpy due to excess tissue. In many cases, it acne rosacea also affects the eyes, which feel irritated and look watery and bloodshot. Even though anyone can suffer from it, people with fair skin who flush or blush easily are prone to develop rosacea. It is more common in women than men, but men tend to develop more severe forms. There is no cure for acne rosacea, but medical therapy helps to keep it under control and to reverse the symptoms. If you suspect you have rosacea, you should consult a dermatologist for diagnosis and treatment. Acne rosacea symptoms vary widely from one people to people and normally only some of the potential sign appear. Medical experts claim that it always includes one of the following symptoms. 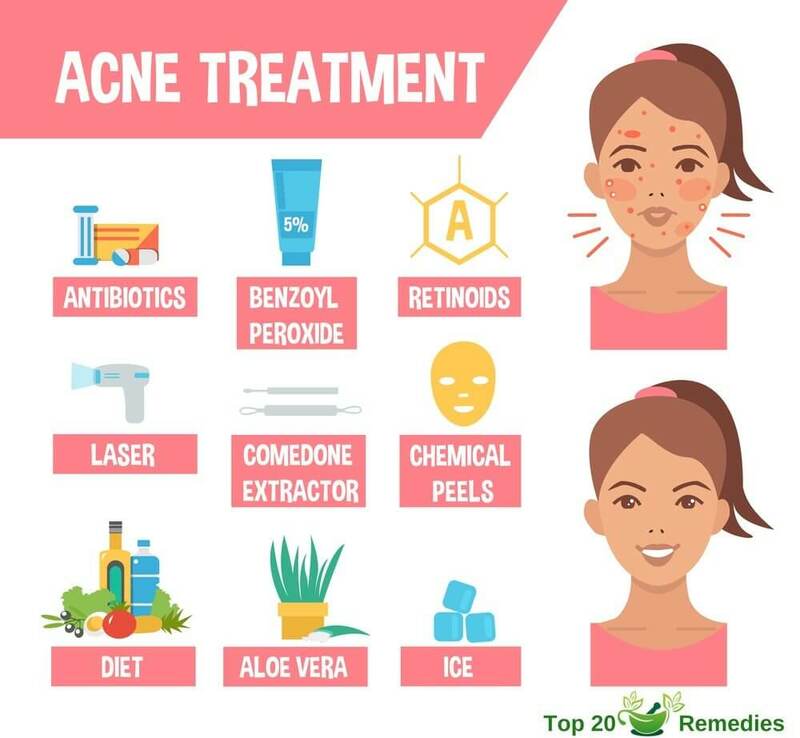 Signs and symptoms vary widely from one sufferer to another, acne rosacea treatment should be tailored by a dermatologist for each particular case. Dermatologists can prescribe various oral and topical treatments to cure pimples and redness associated with the disease. Generally, the initial treatment consists of oral antibiotics combined with topical treatment to bring the condition under control, followed by long-term topical treatment to maintain it. In some cases, laser or intensely pulsed light therapy are used for acne rosacea treatment, in order to reduce redness, remove visible blood vessels and correct nose disfigurement. Ocular rosacea is usually treated with antibiotics. Causes While medical science has yet to fully understand the causes of Rosacea in order to develop cures, extensive studies performed among patients have revealed common triggers which have proven invaluable in furthering our understanding of this disorder. Stress, exposure to the sun, or intense humidity, and cold weather conditions accompanied by strong winds, as well as manual labor and extensive exercise all worsen Rosacea or trigger flare-ups. Use of vasodilators and topical steroids are among known causes of Rosacea in vulnerable sufferers as well. Since emotions have a clear part to play in this disorder, patients who frequently flush or blush, or are going through menopause are at higher risk for Rosacea than others. Foods and drinks have a well-established link with Rosacea—particularly spicy foods, caffeine, alcohol, excessively starchy or oily substances, dairy-heavy foods such as cheese and sour cream, as well as yeast extract contribute to flare-ups. It is the same with acidic foods such as citrus fruits, vinegar, and other foods which have high histamine content such as fermented products (cheese), smoked meats, pickled foods, beans, pulses, and nuts, etc. 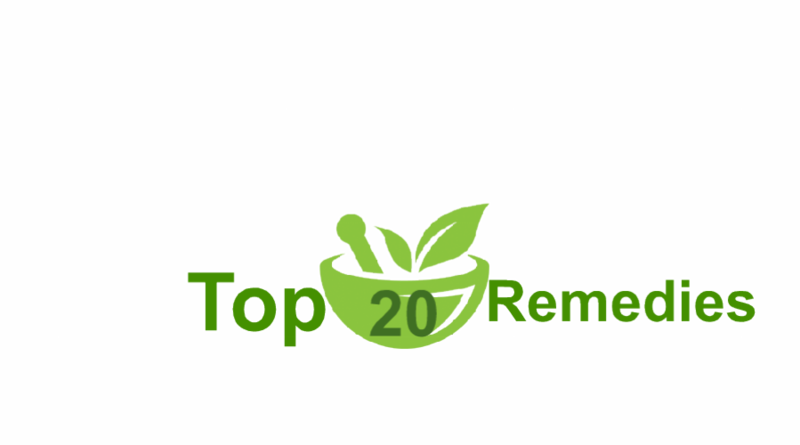 Apart from the triggers listed above, factors such as hot baths and beverages, particular cosmetic products or topical preparations, broadleaf vegetables, etc. are also well-known to cause Rosacea flare-ups, which means that dietary and lifestyle choices have a rather large part to play in the management of this disease. But, don’t lose hope—while a portion of sufferers has recurring bouts with Rosacea for thirteen to fifteen years, others see this disorder come and permanently go away quite a lot sooner. Apart from lifestyle and dietary triggers, the presence of Helicobacter Pylori, as well as skin mites known as Demodex, are also known to cause Rosacea flare-ups. As a rule of thumb, application of any rubbing alcohol or exfoliating agents on the affected areas will only worsen your discomfort and pam. People who suffer from acne rosacea are advised to consult their dermatologist to make sure the skin care treatment they are using is suitable for their condition. Patients are usually advised to use mild and non-abrasive cleaners to wash their face, rinse it with warm water and blot it dry using a soft cotton towel. They should only use non-irritating products and use a sunscreen with an SPF of minimum 15 to protect their skin from sunlight. If you have acne rosacea, you may use cosmetics to conceal the effects. Green tinted, followed by a skin-tone foundation in natural yellow tones can be used to conceal redness. Makeup with pink or orange hues should be avoided. Avoid hot drinks, lots of coffee, spicy foods, and alcohol. Although most people think acne rosacea is linked to alcoholism, it can also affect someone who doesn’t drink at all. Practice a good sun protection and avoid extremely high or low temperatures. Avoid aggressive behavior against your face, such as rubbing or scrubbing, as it can irritate the reddened skin. Workout only in cool environments and do not overheat. Avoid cosmetics and skin-care products that irritate your skin and use hair sprays properly. Try keeping a diary of all flushing episodes and write down what foods, products, medications activities are they associated with. Even though the causes are still unknown and there is no acne rosacea treatment that can ensure you got rid of it forever, there are a lot of things that do help. Consulting a dermatologist and getting the right treatment, as well as following these lifestyle guidelines, can decrease the risk of pustules and redness and help you keep the situation under control. Mix some chamomile herbal tea bags to 3-4 mugs of boiled water for 10 mins. put in the fridge for some time. Use it on the afflicted rosacea areas using cotton wool. Chamomile has great relaxing abilities. It’s a marvelous natural remedy for lessoning skin redness. the area which if not removed could once again worsen the rosacea and acne issues. Soak a cotton ball in jasmine oil and carefully massage it on the afflicted part. as it could also induce allergy. In instances of breastfeeding or pregnancy, don’t use jasmine. You might include yogurt in your diet regimen every day to avoid infections and minimize the intensity of rosacea. Consume 2-3 glasses of yogurt every single day to keep your immune system functioning well. a minimum of 2 times each day will certainly help to heal this skin ailment. Use a skin cream containing feverfew on Rosacea impacted skin. Feverfew has anti-inflammatory characteristics, which are reliable in eliminating inflammation of the skin. Avoid utilizing feverfew throughout pregnancy or while nursing. Wash your face, and afterward use camphor oil on the affected areas of your skin. half an hour. After that, rinse it off with cool water. Continual usage for a month will certainly aid in removing the trouble successfully. 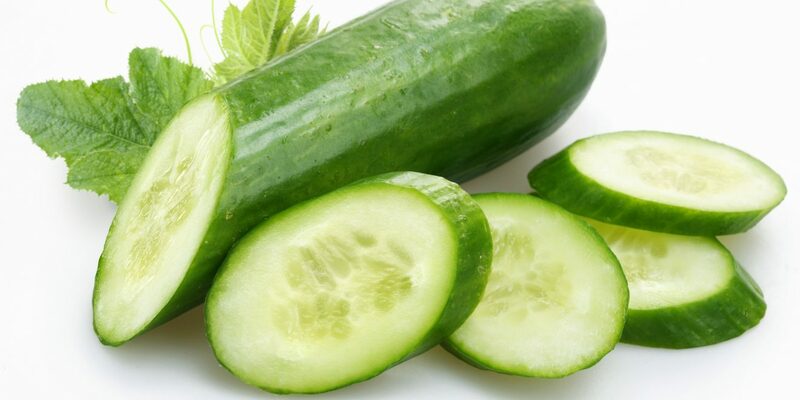 Cucumber is great for skin and assists in normally tightening and cleans of your facial tissue. 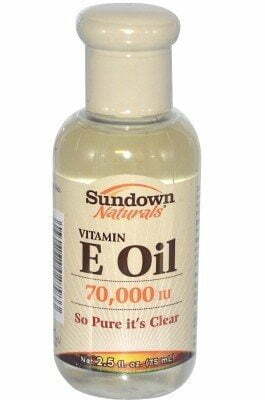 Vitamin E Oil There are plenty of oils available in markets which contain Vitamin E. This is particularly useful in helping the process of repairing damaged skin and reduces the inflamed redness which is commonly seen in this skin disorder. 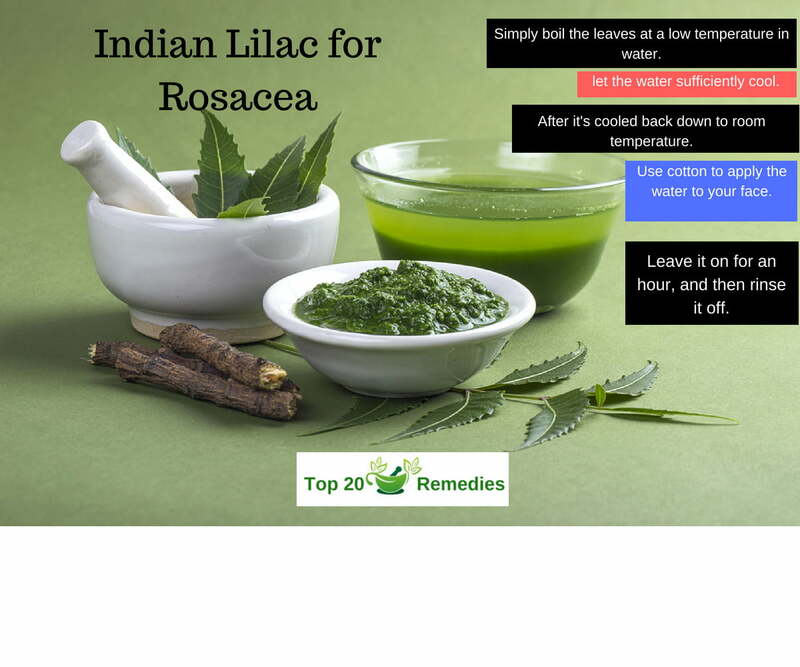 It soothes the dermal irritation caused by the symptoms quite effectively, though it may not help solve underlying conditions which caused the Rosacea in the first place. Topical application twice daily would help people with normal or dry skin in particular. However, if you already have oily skin, you may want to consider using a face wash before applying this remedy, or you may wish to abstain from it altogether for fear of making matters worse. Tea Tree Oleum Extract As we’ve discussed before, one of the underlying causes of Rosacea is the presence of microscopic Demodex skin mites. Medical studies have proven that this extract can effectively kill off any existing Demodex mites on your skin, and may help manage Rosacea and reduce flare-ups while encouraging remissions. 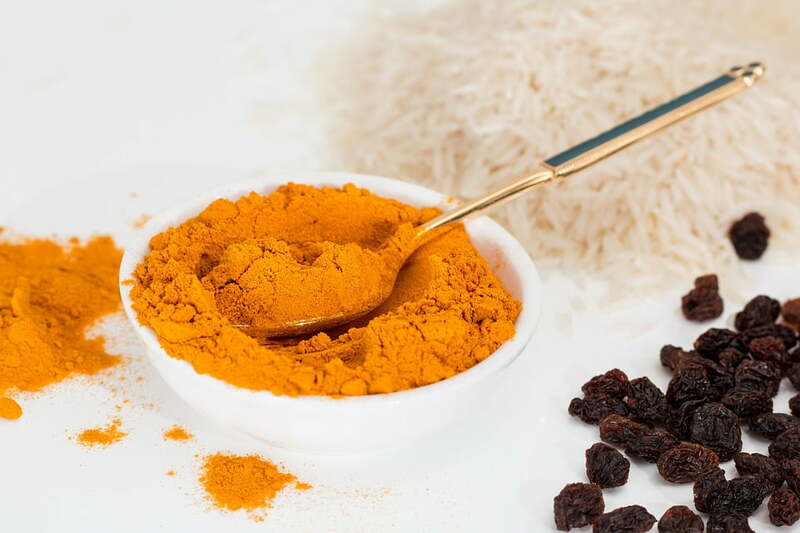 However, it must be kept in mind that for some skin types—particularly people with extremely dry and flaky skin in the affected regions this remedy may be irritating or stinging on the skin. Therefore, caution is advised. If you’re unsure about whether this remedy is suitable for your needs, apply a small amount in a test area first to ascertain whether it would help you or not. Olive Leaf Extract Readily available in capsule or other orally ingestible forms in markets or online, this particular remedy acts as an immunomodulator and antibiotic. It’s a potent detoxifier that boosts your body’s immune system, helps flush out toxins, and gets rid of pesky foreign pathogens which may be lying at the root of your Rosacea. However, be aware that these extracts are often quite potent in terms of dosage, and so they should not be ingested until you have a solid idea of your optimal dose. If necessary, it may be better to consult your physician on the ideal dosage sizes for you. Probiotic Drinks I’m sure that you must have come across tiny bottles of these drinks in your supermarket while you were out shopping. Well, if you’re not quite sure of what they do—probiotics help boost the helpful symbiotic bacterial growth in your intestines. The positive bacteria which live in your intestines basically help break down food, flush out impurities and toxins, and help keep your internal digestive environment glowing with health. Imbalances in these intestinal environments are often caused by unhealthy food, over-reliance on medicines such as antibiotics, etc., and can trace their resultant effects to many disorders such as skin conditions, feelings of bloatedness, fatigue, etc. Even if you don’t suffer from Rosacea, you should still make it a habit to take one small bottle of probiotic drink, or probiotic capsule supplements if available, just to take care of your internal health and well-being. If you’re health-conscious and like staying updated on latest health trends, you’ll have heard of this. 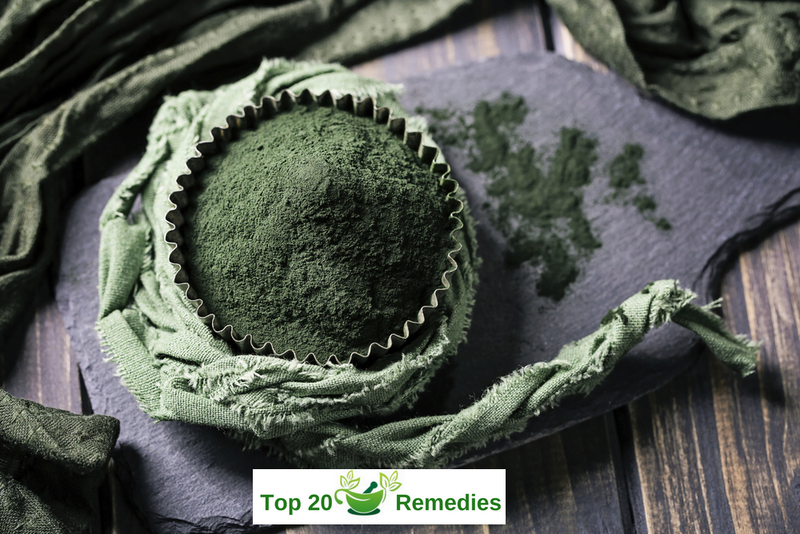 Spirulina cyanobacteria, a rich source of vitamins and minerals, is commonly used as a nutritional food supplement or additive today, especially in green smoothies and their ilk. It’s a filamentous cyanobacterium which is commonly found in warm water bodies of Central and South America and is also hailed as a powerful antioxidant. Available in powdered or capsule forms, dried Spirulina should be ingested in small amounts as an additive to healthy drinks at least once a day. This is an effective way to build up your energy, clear the toxins and free radicals in your body, while at the same time help you maintain your internal health so that you can minimize your skin’s sensitivity, and in doing so, reduce flare-ups of Rosacea. Oatmeal Packs Although rather unconventional, oatmeal has been preferred as a home facial treatment ingredient for a while now. Proven to be a great cleanser, it has rather soothing properties for the inflamed and irritated Rosacea-affected skin. If you have extremely dry skin, you can also soak your oatmeal in cold milk, and apply it once every few days as a face pack. Leave it on for about an hour, and then wash off with a trusty face wash.
Indian Lilac This particular tree is indigenous to the Indian subcontinent, though it’s globally available in various forms today. Everything from its roots to twigs and leaves holds medicinal properties. You can either avail of it as ingestible capsules, or you may wish to look for face washes which contain extracts from it. If you can, try to get your hands on the leaves of Indian Lilac (also called Nimtree or Neem). You can use them every day to make your own antibacterial, anti-inflammatory, soothing face pack. Simply boil the leaves at a low temperature in water, and let the water sufficiently cool. After it’s cooled back down to room temperature, use cotton to apply the water to your face. Leave it on for an hour, and then rinse it off. This, in particular, can be a daily activity that not only suits all skin types and greatly helps reduce Rosacea, acne, and pimples, it also leaves a healthy after-glow on the skin which leaves you looking radiant. 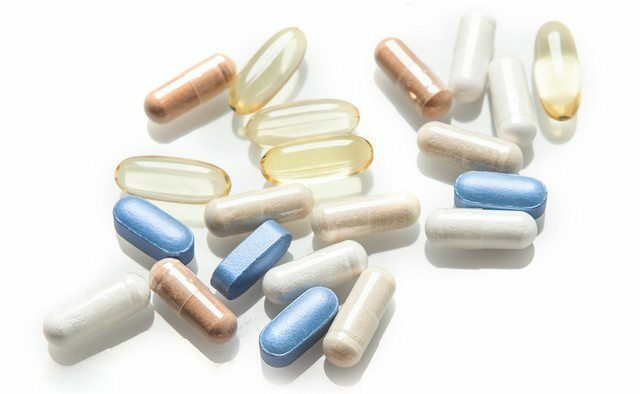 As I’ve mentioned before, regardless of whether you’re a Rosacea patient or not, you should strongly consider including one dose of probiotics every day. The ancient Chinese as well as Indo- Arabic wisdom linked overall health to the state of the stomach and intestines—and modern medicine validates this theory in many ways. 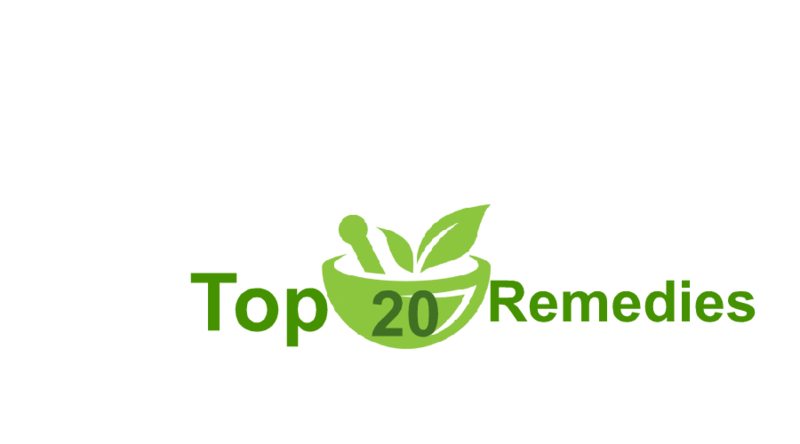 Therefore, the better you treat your stomach and intestines, the more efficiently your body’s digestive system will absorb and utilize nutrients while discharging unnecessary wastes and toxins—which yet again provide a large amount of Rosacea triggers. Include herbal supplements such as Flaxseed oil, Gotu Kola, and small amounts of Liquorice (Licorice) in your daily diet since they provide valuable nutrients which act as an internal anti-inflammatory, soothing, and healing agents. If you can, replace red meats with fish in your diet, which would provide omega- 3 fatty acids. Lastly, while it’s not related to dietary modifications, and although some form of exercise may cause flare-ups in Rosacea, this doesn’t mean that you shouldn’t exercise at all. Instead, switch your exercise times to cooler periods of the day, or hold them in air-conditioned spaces where you won’t heat up or sweat as much as you normally do. Rosacea, while exceedingly inconvenient and sometimes distractingly painful, isn’t difficult to manage as long as you’re willing to make sacrifices in your diet and lifestyle. VVhile symptoms can be avoided by simply sticking to medicines prescribed by your physicians, what you’d gain in being able to continue eating your beloved spicy, fried foodstuffs, you’d lose in sleepless nights with aggravated, irritated, inflamed skin and facial stinging or burning every time you come in contact with stronger breezes and direct sunlight. Only you can decide if making those choices is worth the pain to you. 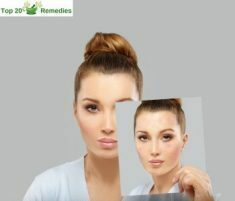 There are hundreds of other remedial ingredients available in your average pantry which can not only help assuage the dermal irritation, but also replenish the oils in your skin and give you a healthy, glowing, nourished look. Although it may have significant external effects on the state of your skin, the biggest damage done by Rosacea is often less physiological and more psychological. It gives birth to self-esteem issues, lowers confidence, erodes positivity and joy, and attaches several conditions to the lifestyle of a patient. Rosacea flare-ups don’t change a person’s internal worth, nor do they erode beauty and grace. It can only affect you if you let it. Therefore, if you feel the need, approach professionals and seek help when necessary without apprehension. As inconvenient as it may seem, don’t let a temporary disorder that’s literally just skin deep affect your perception of yourself or your confidence and self- esteem. As numerous as these problems seem, never forget that there are many others who suffer and seek remedies just like you. So share your knowledge and experiences whenever you can.